Using our well-designed manual register forms, keeping track of all your credit card and debit card transactions has never been easier! Even if you currently use one of the fine software applications available to maintain your money card accounting, by first entering your transactions manually into a manual register like ours soon after the transaction, entering these transactions into your software program, or editing your transactions in software that downloads your transactions from your financial institutions, becomes much easier, because you will have organized your receipts, identified the vendors and recorded the purposes for each purchase already upon making prompt entries into your manual register. No more scrambling around looking for your receipts weeks later, or trying to figure out what a purchase was for from the credit card statement because the vendor name on the statement is different from the vendor name you thought you would recall. AND FOR THOSE WHO LIVE CLOSE TO THE EDGE OF THEIR CREDIT LIMITS OR AVAILABLE FUNDS -- Use our credit card registers and debit card/checking registers, and keep the Available Credit column up to date (for credit cards) and the Balance column up to date (for debit cards), and you will never be in the dark again, not knowing how much credit or funds you have available. You will always know how much is available at any moment! Whenever you present your credit card or debit card for payment, you will never feel uneasy again about whether or not you have enough credit or funds available to pay for your purchase, or worse, suffer the embarrassment of hearing the cashier or waiter say to you "Sorry, your card was declined". In fact, one of our styles currently being developed, our U.S. currency-size register, is designed to be carried in your wallet or purse, so you can refer to it right in the store, gas station, restaurant -- wherever! -- so that you can be sure to select from your assortment of money cards the card that has enough credit or funds available to cover the purchase. (Until it is available, you can use our looseleaf registers -- just cut off the top portion). Our various registers include solutions for several different situations, some depending simply on how many money cards you need to keep track of, others depending on how useful it would be for you to have your account information readily at your fingertips. The following descriptions provide a general overview of these solutions. CLICK ON ANY IMAGE BELOW TO GO TO ITS PRODUCT PAGE FOR FURTHER INFORMATION OR TO PURCHASE (or click on one of the Categories in the left panel). 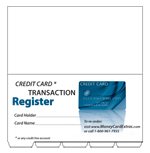 Our standard credit card register is a booklet just like the classic checkbook register booklet with the same dimensions, and fits right into the same checkbook cover as the check register. This is ideal if you have one to four credit cards, for you can insert up to four registers into a single checkbook cover, along with the checkbook and its register. We also offer writable tab dividers specially designed to insert between the booklets so that you can easily distinguish one from the other (purchased separately). Our Slim credit card register is a booklet exactly like the standard version, only with fewer pages in order to make it slimmer. 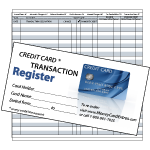 We provide this slimmer register so that if you have five to seven credit cards, you could fit all of these registers into a single checkbook cover, along with a checkbook and its check register. We also offer writable tab dividers specially designed to insert between these booklets so that you can easily distinguish one from the other (purchased separately). 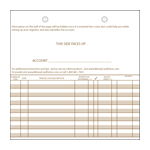 Our Looseleaf register sheets, which are available for both credit card and debit card/checking accounts, are ideal for those who have up to ten, even more, money cards. Like the registers above, these are designed to fit snugly into a single checkbook cover, sharing the cover with a regular checkbook and using the looseleaf registers for the check transactions as well. Once inserted and sectioned off by account, these looseleaf sheets resemble normal booklets. We offer writable tab dividers specially designed to insert between the looseleaf sections so that you can easily distinguish one account from the other (purchased separately). The sheets are two-hole punched so that you can store them securely within a standard two-hole binder cover when they get filled up and removed (we will offer a more customized storage binder in the near future). Note that you can mix and match different register designs within one checkbook cover. Depending on your circumstances, you may find it more suitable to have, for example, one standard size credit card register, two Slim credit card registers, six looseleaf sheets tracking two credit cards, and nine looseleaf sheets tracking three debit cards, along with a regular checkbook register and its checkbook, all in a single checkbook cover! For debit cards we intend to eventually provide debit card organizers, special wallets that house your debit cards and debit card registers. If you currently use such an organizer, the neat little debit card register pictured here will likely fit well within it, but it also is designed to fit right into a credit card/debit card slot in any regular wallet. Also, since debit cards are often connected with a checking account, we also carry classic check registers, which are suitable for both check and debit card transactions. 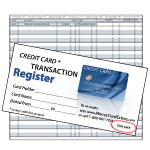 We also offer check/debit card registers in larger print with larger rows for those who are visually impaired or those who simply welcome less stress on the eyes (we intend to eventually offer the same for credit card transactions as well) Note that this register is larger also in its dimensions and does not fit into a standard checkbook cover. 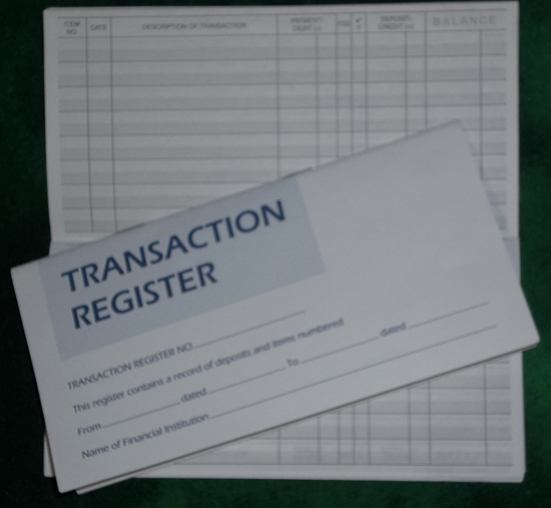 To round out the various registers, we also have a savings account register booklet available. 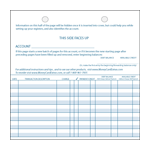 Our standard check register described above provides a page for 14 savings account transactions, but this savings register is an entire booklet dedicated to savings account transactions providing 71 entries. 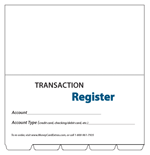 As referred to above, in order to distinguish one register from another when several are contained in a single checkbook cover, we offer specially designed tab dividers with writable tabs (purchased in 5-cut sets as pictured). We have two versions, one for when the multiple registers are all credit card booklets, as the graphics on the divider are the same as the graphics on the credit card booklets, thus creating a seamless flow from one booklet to the next. 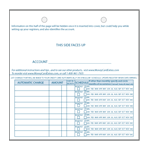 (Included with this version is an additional sixth tab divider with general banking graphics under the assumption that there is at least one debit card/check register in the checkbook cover). The other version has the same dimensions, but has more general graphics designed for using the looseleaf registers, since one can mix several credit card and debit card/checking registers within the same checkbook cover. Lastly, no register is complete without at least one page for keeping track of automatic transactions. Referring to such a schedule that lists these automatic transactions keeps you prepared so that you can be sure that ample funds are available when the transactions post to your accounts. Our booklet registers include a page for automatic transactions, and as accessories to our looseleaf registers we provide looseleaf schedules for automatic credit card charges and looseleaf schedules for automatic payments and deposits for a debit card and/or checking account (purchased separately). As emphasized earlier most of our registers are designed to fit within a standard size checkbook cover (the exceptions being the registers designed for wallets and the large print register) and to share that cover with a checkbook and its register. One reason we decided to produce this size for our register styles is for the convenience of using a single cover for your checkbook and its register, and your credit/debit cards and all of their registers, especially since many checkbook covers are already designed with slots for carrying money cards. So to have one or more money card registers within the same checkbook cover as the cards, along with the checkbook and its check register (which tracks as well any debit cards linked to that account), completes the functionality of the checkbook cover. However, with a checkbook and several registers and tab dividers inserted within a single checkbook cover, the checkbook cover obviously will become somewhat bulky. Hence our recommendation is that you use a well constructed checkbook cover made from durable materials, whose pocket in which the upper register covers are tucked can accommodate a stack up to about one-fourth inch thick (if choosing our looseleaf registers). Also the cover should have a snap, velcro, zipper, etc. closing mechanism so that the cover stays closed and compact when not in use. Indeed, as our product line expands, we intend to offer many suitable checkbook covers that you can purchase from this website. Please browse through our product catalog from the sidebar at the left. There you can access a more complete description of each product, along with its price, discounts, and features, and place in your shopping cart the products you would like to purchase. As a new online store, we are still in the process of developing the full line of products and services we envision, so we hope that you visit us frequently, and also join our newsletter email list so we can inform you of new products and online resources. Thank you for visiting MoneyCardExtras.com!